The complainant, Sanjukta Basu, had first served a legal notice to the channel on April 24, 2018. 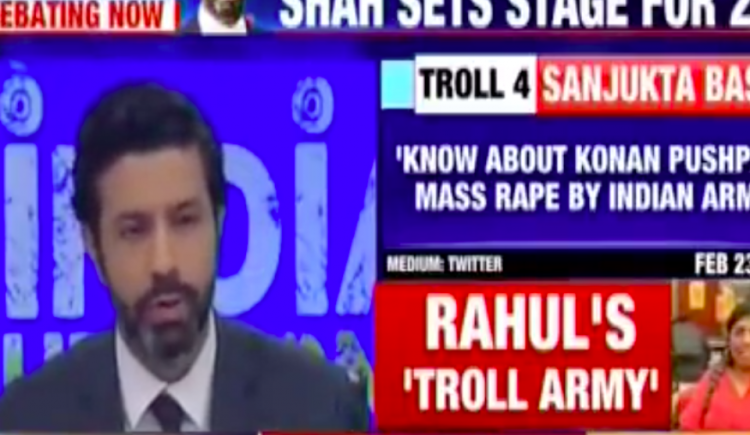 A screenshot from the show in which Sanjukta Basu was called a troll. New Delhi: The News Broadcasting Standards Authority (NBSA) has issued a notice to television channel Times Now for using derogatory terms like “Hindu hater” and “vile troll” against an individual on TV. The complaint pertained to programmes India Upfront and News Hour Debate which were telecast at 8 pm and 9 pm respectively on April 6, 2018. The complainant, Sanjukta Basu, had first served a legal notice to the channel on April 24, 2018 and on not finding the reply dated May 16, 2018 satisfactory, approached the NBSA, which is the second level of complaint redressal. She lodged her e-mail complaint with the NBSA on March 25, 2019. A letter from Annie Joseph, on behalf of the NBSA, and addressed to the authorised legal representative of Bennet, Coleman and Company Limited, which owns the channel, said Basu had “a grievance against the Times Now TV channel for running a defamatory program against her dated 6th April 2018, whose telecast violated the Guidelines on Broadcast of Potentially Defamatory Content – basic guidelines No. 5, No. 8 and others”. Joseph’s letter said Basu also “stated that she explained the broadcaster that it was wrong to attack her name, fame and integrity in its political program, and requested the broadcaster to apologise but the broadcaster didn’t apologise”. Stating that the NBSA considered the complaint and the response from the broadcaster, and also viewed the broadcast, Joseph wrote that “NBSA was of the view that the broadcaster was in breach of the Specific Guidelines covering reporting relating to ‘Accuracy, impartiality, objectivity and neutrality and fairness” which stated that “for balanced reportage, broadcasters should remain neutral and ensure that diverse views are covered in their reporting, especially on a controversial subject, without giving undue prominence to any particular view”. The NBSA also found the broadcaster to be in breach of the “Guidelines on Broadcast of Potentially Defamatory Content, basic guidelines No. 5, No. 8 and No.9”. It therefore decided to call both the parties for a hearing at noon on May 1, 2019 at Seminar Hall No. 3, India International Centre.